Japan-China Super Go is an important competition held yearly between the top Japanese and Chinese players. The Chinese Team always selects its best players for this event. The competition system imitates the format of war in the old time. The first game starts between two lady players from both sides. Each player strives to win the game and continue to fight her or his next opponent. Teammates will continue to play in case their anterior teammate lost the game. One team will declare victory when the last player of the opposing team is defeated. Since 1998, the rules of the competition were revised, instead of playing one by one for one team title, each side will have three players fighting for three titles with 2 of 3 games. 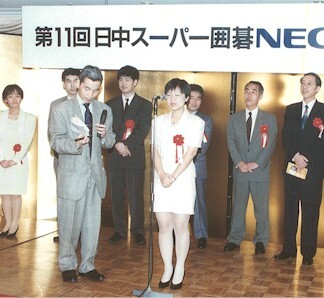 The three players are the title owners of NEC Cup Champion, New Start Champion and Women's Champion of the year in each country. She played with Japanese player Koyama Miziloo. Here she is reviewing the game.